Next to garlic, onions are one of the easiest things to grow. Requiring little attention they are a hardy plant that can and will do well in just about any environment. If you are a beginner gardener, learning how to grow bigger onions is a great way to get your feet wet. Another plus is onions, once harvested, will last quite a while if stored correctly. Whether you keep them in a cool dark root cellar, add them to canning recipes, or dice/slice and freeze, you can easily enjoy this harvest throughout the winter months. With so many varieties and uses, onions are a staple in just about every home. If you have never tried your hand at growing onions, I encourage you to follow these steps and give it a try. Why go to all the trouble of planting your seeds only to have unhealthy soil ruin your summer harvest? 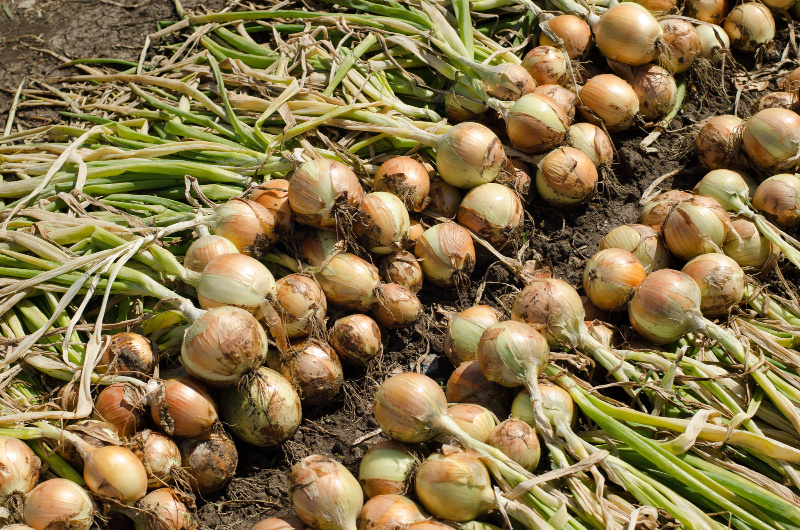 Take the time to prep your soil to ensure you have big healthy onions come fall. Ninja Tip: Onions prefer Nitrogen-rich soil so keep this in mind when preparing to plant. You can purchase an inexpensive soil testing kit so you know just exactly what improvements your soil needs. With so many choices out there you can get lost deciding exactly what to plant. I prefer the yellow and white variety onion and I have very good luck with these two each year. Choosing the right variety depends on where you live and what flavor you prefer. My best advice is to try a few and see what you like. This is a pretty thorough list that will give you an idea of what onion varieties are available. Where I live sets work the best. They are easy to plant and require less attention than seeds. The cost is still pretty low with this option, about $2 a pound which will give you approximately 100 or more sets depending on the size. If you prefer the less costly seed option be prepared to do extra weeding since the seedlings can easily be crowded out especially in the beginning when they are small and fragile. You can also start your seeds indoors and transplant when they are bigger. Seeds need to be started about 6 weeks prior to outside planting and hardened a few days to acclimate them to your weather. Here in Pennsylvania, I have found it is best to plant onions just as soon as you can work the ground which for us is late March or early April. If you miss your window to plant, don’t worry you still can. I have planted as late as June and have been fine. Just know that the later you plant the later your harvest will be. The trick is to harvest before the weather gets too cold in fall. Be aware that since you will have a shorter growing time, you may also have smaller onions. If you plant a large number of onions, it is best to stagger your plantings. This way you will have a steady stream of ripe onions come fall. 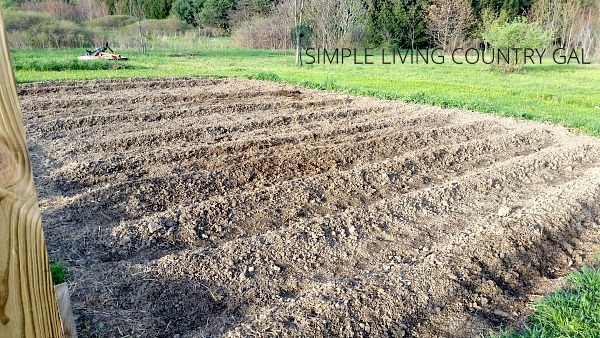 To do this plant your first row of onions then plant additional rows each week until you are completely planted. Our entire property is wet, really really wet. I experimented a few years ago by planting my onions in raised rows and my onions were huge! I was so impressed with how well they did, that I now plant most of my veggies this way. 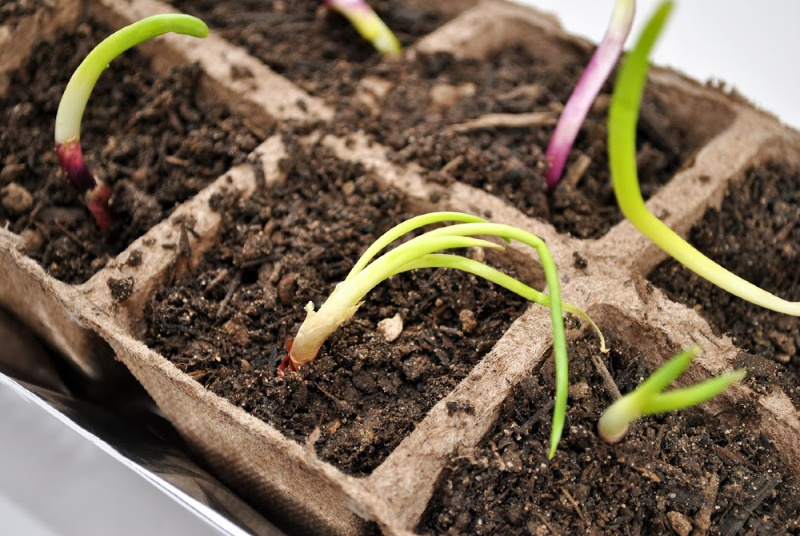 Be sure to space your onions 4-5″ apart and plant sets or plants at 1″ deep. I also keep my rows at 18″ apart. When growing onions this spacing allows enough room for me to get down the rows without risking injury to my plants, yet not so much room that I am wasting valuable garden space. Since onions require very little attention, mulching well is important. I used to forget about my onions giving my best care to my delicate tomato and pepper plants. When it came time to harvest my poor onions would be lost in a sea of weeds. Because the weeds stole all the nutrients from the soil my onions would be small and soft. 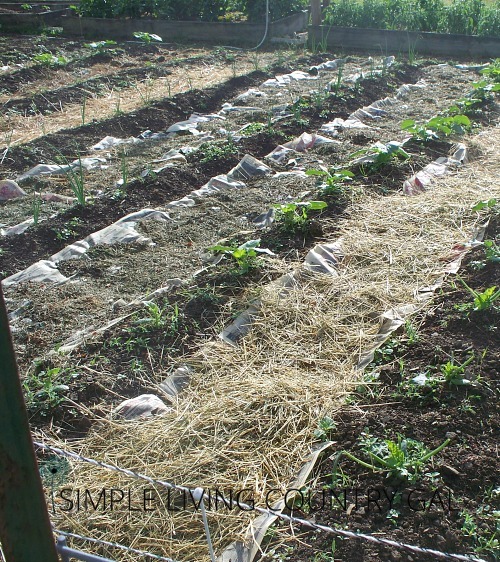 To mulch simply lay a layer of newspaper down on the ground and cover with cut grass or straw. The newspaper will naturally compost down as the growing season progresses and will act as a barrier limiting the number of weeds that will grow. Now that I am mulching my raised onion rows, I only need to weed around the very base of each plant. A weedless onion is a happy onion. Ninja tip: Be careful when weeding so you do not accidentally pull out your onion plant. This can be a bit tricky. Water too much and you will encourage diseases. Water too little and you will produce small and weak plants. Mulch is also very helpful with watering, it ensures better drainage and keeps the soil moist longer. Ninja tip: if you want a sweeter onion, water more steadily. Be sure to keep water off of the leaves since this can promote fungal diseases. A soaker hose is a perfect option for this. 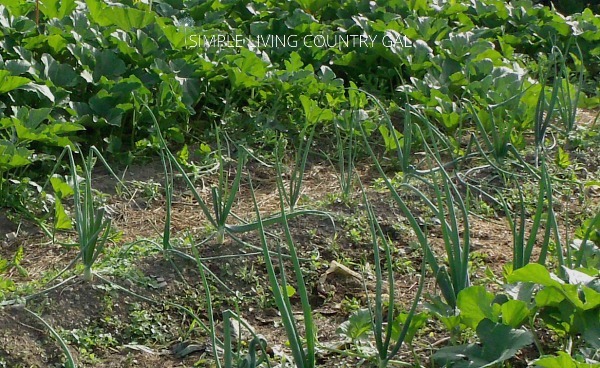 Drought onions tend to be a bit pungent so keep this in mind when growing. As your onions grow they will emerge from the ground exposing part of the onion. At this point, I would not cover your onions with soil. I was told to do this once and my onions were small and soft. Leave your onions as they are. The biggest problem I have had with my onions is bolting. Bolt is when an onion produces a flower and this is bad news for the onion. This can occur especially if the growing season is wet or chilly. If you see an onion bolt, it is best if you remove the stalk and the flower. More often than not, once an onion bolts the bulb is done growing. Don’t worry though. You can harvest your bolted onion, dry and use as you normally would. They may be small but will taste just fine. You can also choose to leave the onion in the ground, but this is not always the best way to go since I have found the taste to be just a bit “off” when I do this. If you have a recurring problem with bolting onions, look for heat treated sets next planting season. I have not tried these but have heard good things. When your onion tops begin to yellow and fall over that means your onions are just about ready for harvest. You can encourage things by bending your tops over and even loosening the soil around the bulb just a bit. After a few days, pull your onions and let them dry on the ground where they are. Pick all your onions shaking off excess dirt as you go. Let your onions sit until the tops are brown and dry. This should take 1-2 weeks. I have found an old window screen works perfectly for this. 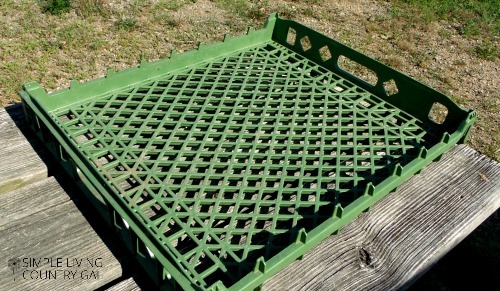 I also have a plastic grate tray that works as well. Once you are sure your onions are dry, remove tops and roots with scissors. I like to remove the outer skin especially if it is brittle and dry. This just keeps things a bit neater in my pantry. 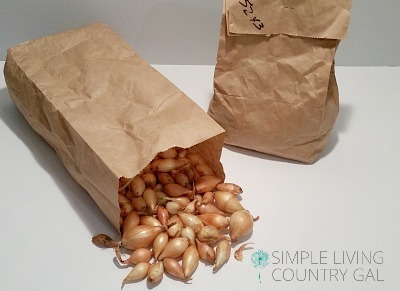 You can store your onions in mesh breathable bags in your root cellar or pantry if you intend to use them up quickly. Check your supply each week for any onion that is beginning to go bad. Onions will last 2-3 months in a pantry and 5-8 months in a cool dry root cellar. Another storing option is freezing. If you plan to freeze your onions make sure you dice them or slice them before you do. Place your cut onions on a foil covered cookie sheet and par-freeze first. Once frozen you can put into labeled freezer bags being sure to remove as much air as you can before your final freeze. By doing this you will keep your onions from getting freezer burn or freezing in a hard chunk. Whether you are beginning your first garden or a seasoned pro, onions can be a great addition. Learning how to grow bigger onions that are huge, healthy and organic is a simple and great way to fill your winter pantry. I am so glad you found tips and I hope they work as well for you as they did for me. I am telling you, the mounds did the trick for me. And I now make them for all my plants even my pumpkins! I always struggle with onions. Thanks for all the great tips. I’ll try them this year! 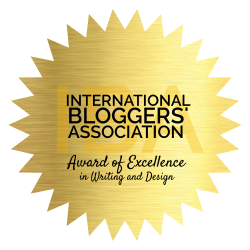 Found your post at the Simple Homestead Blog Hop. I have to tell you the game changer for me was the raised rows. Our soil is just awful here and once I raised up the rows my onions went crazy! I hope this helps.